Hiver Shared Mailboxes are a great way to manage shared email accounts like support@company.com or sales@company.com. 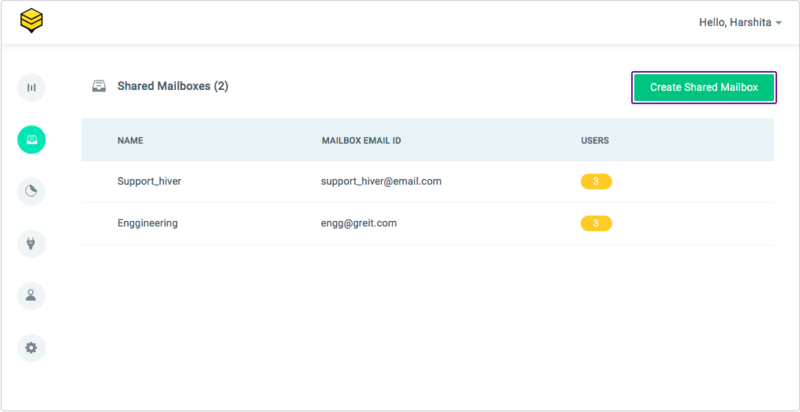 By using Hiver, you can easily share, delegate and keep track of email communication in your shared email accounts. Click on the prominent green button 'Create Shared Mailbox' to view the page for creating a Shared Mailbox. Fill in the page by entering the email address to be set as the Shared Mailbox, the name of the Shared Mailbox and email addresses of users who will access and work on the emails in the Shared Mailbox. 2) Group or an Alias: This is a group or an alias account set up in your G Suite account, with users added to it. The group simply forwards the emails sent to it to the users added to the group. You'd need not have a password for this. For Gmail accounts, Hiver requires you to log into the account with a password. So, if you are setting up support@mycompany.com as a Shared Mailbox, Hiver will require you to log into support@mycompany.com with the Gmail or G Suite password for this account. 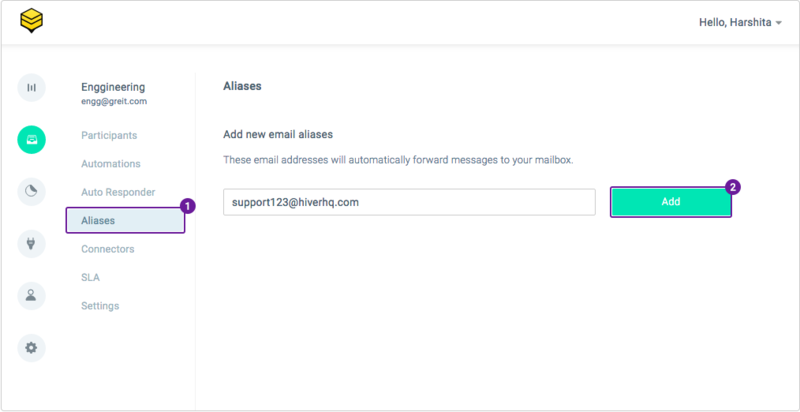 This is required for Hiver to be able to connect to this account and share the emails received in this account with all users who are managing the shared mailbox. For Groups and Aliases, Hiver requires that the emails being sent to the email account is set up as Shared Mailbox are delivered to the Gmail account of the user doing the setup. Please make sure your group or alias is set up to forward emails to your email address for this to work correctly. 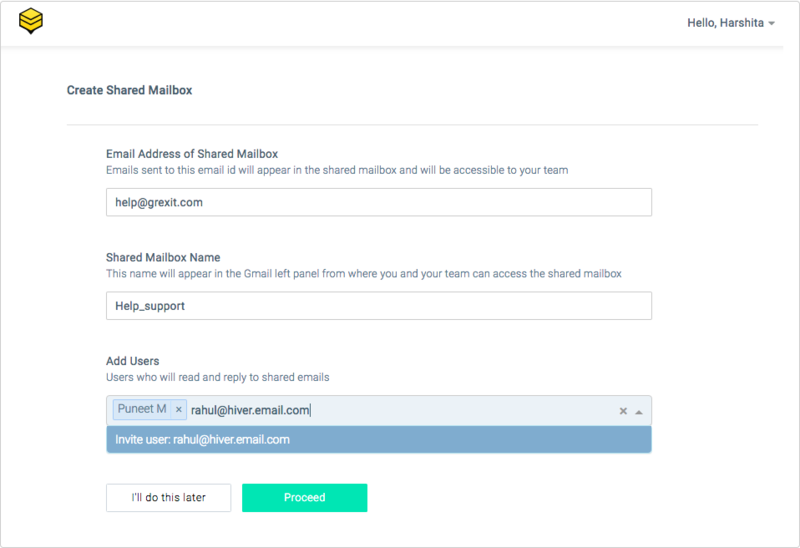 Hiver automatically creates Gmail Filters for emails sent to the Shared Mailbox email address to 'Skip the Inbox' and show up only under the Shared Mailbox Unassigned list. A mailbox alias is any email address that automatically forwards messages to your main mailbox address. If you have one or more email addresses that auto-forward emails to the Shared Mailbox address then you should add them to the Alias field. You can include the alias information after the Shared Mailbox has been set up. Click on the 'Alias' tab on the left to open the page where you can enter the alias for the Shared Mailbox id. You can start using your Shared Mailbox as soon as it is set up correctly. Learn more about managing emails in your Shared Mailboxes.